You are currently browsing the tag archive for the ‘david cameron’ tag. It does exist after all. Apparently it has been broken for a while and now requires enlargement. 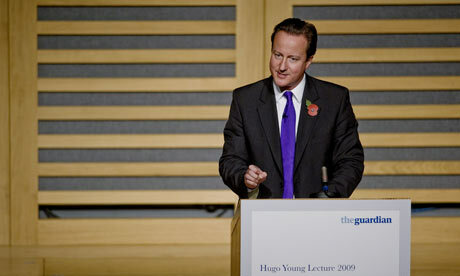 Delivering the 2009 Hugo Young lecture at the Guardian, David Cameron stated that he wanted a “big society”, in place of Labour’s “big state”. He believes that the “growth of the state has promoted not social solidarity, but selfishness and individualism”. The alternative is to “help families, individuals, charities and communities come together to solve problems”. Cameron’s calls for cuts in the scale of government are obviously pandering towards the fiscal conservative wing of his party. To some extent he continues the tradition of earlier conservatism, defined by Thatcher, in which the state was blamed for the moral degradation of society. The state fosters a dependency culture, discharges people from their responsibilities, and displaces families as the proper purveyor of moral values. Cameron’s true volte face is in coming up with new victims for the state’s malice. Cameron blames government for worsening many of the themes that have traditionally been the concern of the left: the gap between the rich and the poor and material deprivation. The large size of the state, he claims, is “inhibiting, not advancing, the progressive aims of reducing poverty, fighting inequality, and increasing general wellbeing”. This appears to be a canny political move. Issues such as poverty and particularly inequality would traditionally be far from the conservative agenda. Cameron believes that by naming big government the culprit, he can mobilise conservative support even for traditionally lefty topics. He can move into Labour’s territory without losing his party’s base, as long as a smaller state is presented as the solution. So far his political gambit seems successful. In Cameron’s view, society consists of individuals, families and communities. Government is external to society and engaged in a zero-sum game with it: The expansion of the state can only be to the detriment of society. Third sector organizations and social enterprise are put forward as the vehicle for delivering on social goals. Cameron believes these institutions to be almost like an extension of communities, accountable to their will and able to engage them in “self-improvement, mutuality and responsibility”. The premise that third sector organizations would be representative of community is often false. Many charities that have been tasked with delivering public services have grown so large they are as unresponsive to the needs of their clients as state departments but devoid of any formal accountability. With a large size they also acquire monopoly-like power over the services that they deliver, and can begin to work for an interest of their own. In that sense they have more in common with large corporations. The opening up of competitive markets in public services to third sector organisations has explicitly encouraged this development. Conversely, the government providing things need not be opposed to citizens taking responsibility. Ideas of design such co-production can make sure that the clients have an active role in the delivery of services. The interface between government and civil society is what matters. Cameron forgets that the state is a part of society too, and that a good society requires strong public investment to maintain public goods and collective solutions. This philosophy makes no provision for preventative services, or long-term solutions of the kind that we now need. In spite of the rhetoric about outcomes, he has reverted with the Conservative obsession with the mode of delivery. Cameron’s emphasis on decentralization and active citizenship is commendable. Who would not want people holding power and being actively engaged in shaping their lives? As means for delivering the changes in society the “progressive conservatives” are after – social mobility and reductions in poverty – they are blatantly insufficient. To reduce inequality we must make a political topic of another forgotten part of society – the economy. All major parties today regard the economy as a sphere with its own natural laws and best left to its own devices. The role of government is merely to correct market failures and fix some of the resulting unjustness after the free reign of economic forces. The question all of the parties fail to ask is whether the economic system itself, with its gross inequalities and individualistic bent could be the root of the problem. Labour’s measures such as the minimum wage and tax credits have obviously mitigated some of the growing disparities in the economy. The Tory promises to lift the threshold of the inheritance tax and cut unemployment benefits can only aggravate them and don’t fit well for Cameron’s newly found interest in the poor. What is needed is a society of many parts: a fair economy, an effective state and a committed community – all of appropriate size. There’s a lot of Green New Deal news this week, so I’ll take it in stages. Today, the fall-out from the confirmation that Heathrow Airport will get a third runway. Tomorrow, I’ll say something about this afternoon’s inauguration of President Barack Obama. Should Britain be building a sustainable economy with a green fiscal package centred on creating millions of green-collar jobs? Or do we plough on with the industries of the past irrespective of their impact on disadvantaged people all around the world? It’s simply laughable to say that “the jobs outweigh the climate danger”. First, climate change will wreak havoc on the world’s economy. Second, the greening of our economy will require us to create huge numbers of jobs across many sectors, not least transport. Hence the need for a Green New Deal. It really is time to ditch the false ideology of environment versus economics. You are talking about a highly carbon-intensive piece of infrastructure that might be finished at exactly the moment when global oil production is collapsing and its price is rocketing. The government’s case is based on fantasy economics. We need to wake up to the fact that the expansion isn’t about jobs for ordinary people. It’s about big business getting it’s way, regardless of how the rest of us are affected. And, yes, I realise that any argument about corporate influence over politicians sounds trite to the point of being a cliché, but the reason it’s repeated so often is because it’s largely true. The news that there is a ‘revolving door’ between Downing Street, Whitehall and airport operator BAA, is shocking, infuriating, but hardly surprising. The stuff in [our proposal paper] will help employ people and bring jobs. We have got to do things that are both good for us now and good for the future. Please, No 10, can we have a green policy? – Lord Chris Smith of the Environment Agency pleads Downing Street for a Green New Deal in the Sunday Times. Overnight, the US is going green – but we’re stuck in a different age – Geoffrey Lean wonders where our Green New Deal is in the Independent on Sunday. How can Labour still fear to act for a fairer, greener land? – Jenni Russell laments New Labour’s failure on economic policy in yesterday’s Guardian. Green light for a boom in jobs – a nice piece in the Sunday Times, featuring nef‘s Policy Director, Andrew Simms.